Juniper took center stage way back on May 5, 2008, as this site’s very first Baby Name of the Day. Since then, it’s gone from intriguing rarity to rising favorite. Plenty of us have great-grandmothers called Lily and Rose, so it’s not surprising to hear parents expanding with newer nature-inspired picks like Autumn and Skye. 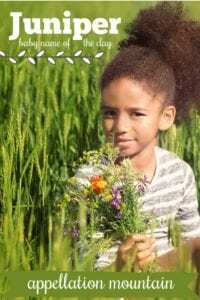 A mix of vintage and modern choices appeal to parents now: Lily, Luna, Hazel, Willow, Skylar, Violet, Autumn, and Ruby all rank in the Top 100 as of 2017. Juniper fits right in. The Latin juniperus refers to an evergreen. They’re found in Nevada and Africa and the Himalayas, the Arctic and Tibet and beyond. All of this might make Juniper feel like a modern innovation, akin to River. Except. Way back in the day, Saint Francis had a companion known as Fra Ginepro – Brother Juniper. The thirteenth century monk is remembered for outrageous generosity, taking the clothes off his back and convincing others to give, too. It’s not clear if he was born with the name, or adopted it later in life. In the eighteenth century, Miguel Jose Serra took the name Junipero when he joined the Franciscan order, in homage to Francis’ early follower. Serra is now considered a saint. There’s also a fictional Br. Juniper in Thornton Wilder’s 1928 Pulitzer Prize-winning bestseller, The Bridge of San Luis Rey. It’s been adapted as a movie more than once; in 2004, Gabriel Byrne played the part. Beyond the religious figures, Ginevra claims history as a given name. It’s the Italian form of Guinevere, and, of course, the full name of Ginny Weasley. But it’s also associated with ginepro, the Italian word for the plant. In a famous Leonardo da Vinci portrait of Florentine aristocrat Ginevra de’ Benci, a juniper tree is seen behind her. A Renaissance-era symbol of chastity, the tree might reflect de’ Benci’s virtues, but it’s also a play on her name. The opposite side of the painting also features a sprig of ginepro, too. At least in Italian, there’s a long precedent for using htis as a feminine name. So how did this name travel from Italy and a handful of male religious figures to the US? For decades, it just plain didn’t. Then in 1968, singer Donovan recorded a sweet single: “Jennifer Juniper.” Fun fact: the song was named for Jenny Boyd, sister-in-law to George Harrison, future wife to Mick Fleetwood, and apparently, the subject of the singer’s affections. Jenny ran a boutique named – wait for it – Juniper. The next year, five girls received the name. By 1974, that number reached 23 births. It helps that the similar-sounding Jennifer topped the popularity charts during the same era. A second boost came in 1993, thanks to the Johnny Depp and Mary Stuart Masterson rom-com Benny and Joon. Joon was short for Juniper. That’s also true for the heroine of the Junie B. Jones series, which debuted in 1992 and wrapped up in 2013. The Cartoon Network’s The Life and Times of Juniper Lee, the animated tale of a tweenaged monster-fighter, debuted in 2005. Early dad blogger Jim started writing a blog about his daughter by the name way back in 2005, too. There’s a character in Percy Jackson and the Olympians who answers to the name, and a few others in young adult fiction. Reese Witherspoon wore it in 2012’s Mud. Goddess name Juno and vintage charmer June also started attracting more attention in the same years, boosting all of the upbeat, summery June names. 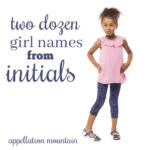 By 2008, there were 107 girls given the name – a new peak. In 2011, that number reached 269, enough to push it into the US Top 1000. And by 2017, there were 1,033 newborn girls given the name, putting it just outside of the current Top 300. It’s slowly gone from out-there rarity to increasingly mainstream favorite. With built-in nickname Junie, and a host of historical and cultural reference points for the name, it feels like a fresh, modern name that’s still rooted in the past. That’s exactly what plenty of parents are seeking today, so we can expect to hear even more of this energetic nature name in the future. Do you like Juniper or Ginevra better? First published on May 5, 2008, this post was revised on April 25, 2011. It was updated substantially and published again on February 27, 2019. Jennifer needs about 60 more years before I’m ready for it to come back. Since Juniper is so close to Jennifer, I just couldn’t use her. BUT… Junie, June, Junia… gorgeous. In Russian, the word for juniper is “Kalina” and in Brazil, we use the Kalinka name, which is a diminutive, as in the Russian folk song. Gorgeous name, Juliana – thanks for the info! I LOVE Juniper, the only things that keep me away from it are (1) it’s similar sound to Jennifer and (2) the creepiest fairy tale I’ve ever read, titled “The Juniper Tree.” If you’ve never read it, and are considering the name for your daughter, I suggest reading this fairy tale first! 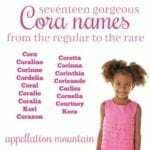 It might be horrifying for a little girl to have that association with her name. I didn’t really like Juniper until I realised Perry could be a viable nickname, curse my adoration of quirky nicknames. But either way, Juniper has a nice vibe to her, my youngest sister was so very nearly named Clover (although we call her Clover often) and my other sister is a Heather, so Juniper could work as an homage to my sisters, especially since my family openly dislikes the use of other family member’s names. A favourite vacationing spot for my family growing up was at a guest house called The Juniper Tree (named for the story from 1 Kings when Elijah rests under/is sheltered by a juniper tree after fleeing from Queen Jezebel). Because of that, I have a hard time seeing this as a girl’s name. I love Jennifer. I really do. How this Cornish oddity ‘conquered the globe’ is beyond me. Ignoring the over exposure for a second, it’s no less strange than Juniper. Anyway, on topic, but not really, is it wrong that I like that it reminds me of Juniper berry scene from The Life of Brian? “Do not tempt Him, shallow ones! 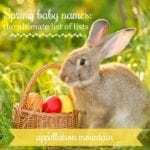 Is not the miracle of the juniper bushes enough?” One reason why I could never take it seriously as a first name for my own child. It’s a middle only. On someone else’s child as a first name? Sure. June is my middle name. It felt conceited to use that on my own child and I’d had mixed feelings about it growing up. Juniper is not a nod to me whatsoever but it is a nod to someone far more special, my grandmother who is also a June. I feel that it should be up in NZ’s top 100 along with the already present Violet, Willow, Lily, Daisy, Hazel , Poppy and Ivy, but I can’t see it getting there. I’d like it to. My husband wouldn’t go for it because the nn June is still too old lady for him, but I wish he would have! I love this name!! Plus it could have been a subtle reference to where our daughter was conceived (an Alaskan cruise around the time we docked in Juneau…I contemplated Juno but thought that she may not want to have to explain that one all her life…). I saw a Juniper nn Juni at a local preschool last year and was thrilled and jealous. I like Juniper – it just sounds happy and has the great nickname of June. Definitely more modern and ‘exciting’ sounding than Jennifer. Probably too ‘hippy-ish’ for my husband to ever like and agree to though. Maybe as a middle name. I actually know someone who named their daughter Juniper just a few weeks ago. I think the reaction among their friends has been pretty mixed, but I really like it. It’s different without being made-up, and can be shortened to something more traditional. I definitely think it’s better than Willow or Heather. I love sweet June, He adores Juno. Neither of us really loves Juniper but I can see it’s appeal. Fresh-faced, pretty and above all, green. Juiper’s not for me but I’m sure Ii’ll meet a smattering of them as tthe years go on. Juniper’s got just enough appeal to rise fairly quickly, I would think. That’s fine. Juniper’s pretty! (and I heartily dislike Willow, so a Jupiter’s a good replacement). I LOVE Juniper – one of the main characters in the Emberverse series by S.M. Stirling is a folk singer named Juniper (the series starts with “Dies The Fire”). She’s a spunky redhead, talented musician and a natural born leader. If I could sell my fiance on the name…. We named our 2nd daughter Juniper almost one year ago. We love it and so does everyone who asks what her name is (tho my mom had a hard time with it at first…). I must say that i was surprised to have no less than 2 people say that she is the second Juniper they’ve met. And now that i’ve done some internet searching, i find it’s out there quite a bit more than i thought it would be. Already, tho, I can tell she will often have to say “…no, not Jennifer — Juniper.” And on a few occasions so far, i’ve even slipped and called her Jupiter. It came up on a Yahoo!Answers question, and I was amazed at how many people actively disliked it. *Shrugs. * But something tells me that Juniper will surface more and more – after all, Willow is really quite hot these days. I really love Juniper. It’s a really cool nature name. June is a great name too! […] was sweet June, ranked a distant #597. […] version of January in the comments, and I’ve been captivated ever since. 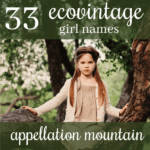 If Genevieve and Juniper are stylish, and French names for girls are all the rage, why not? […] Juniper – A big favorite in name circles, she’s a successor to Jennifer and Heather, too, and it just so happens, the first-ever Baby Name of the Day profiled at AppMtn. […] Josie’s little sis be known as Junie?